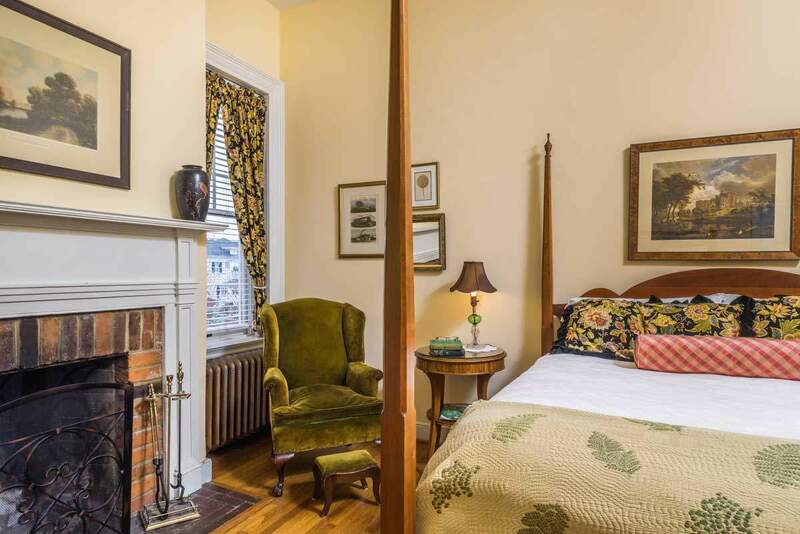 Our historic inn perfectly balances yesterday’s charm and culture while providing the modern amenities appreciated by today’s travelers. 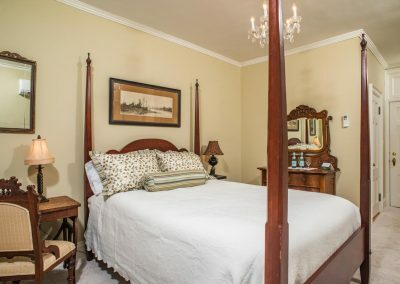 Tucked within The Kenmore Inn are 9 unique, individually decorated guest rooms that capture Fredericksburg’s rich history and residential style. 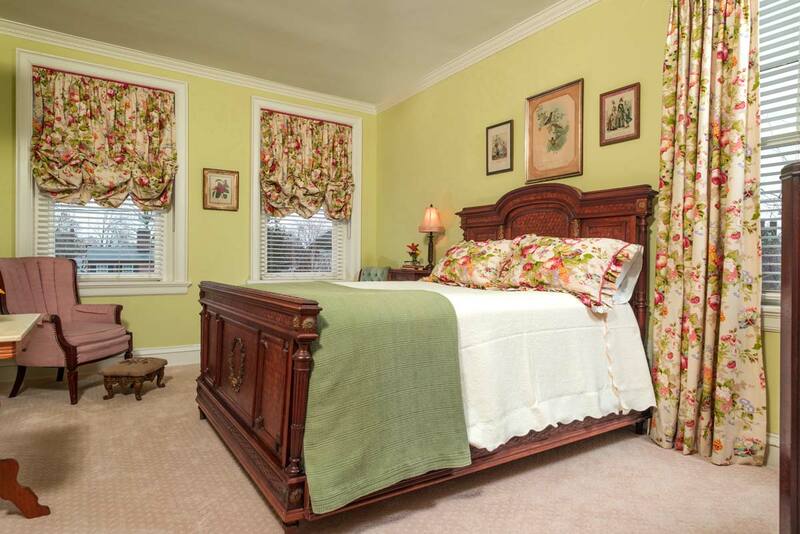 Each is custom designed and furnished to make you feel at home while experiencing a part of history. 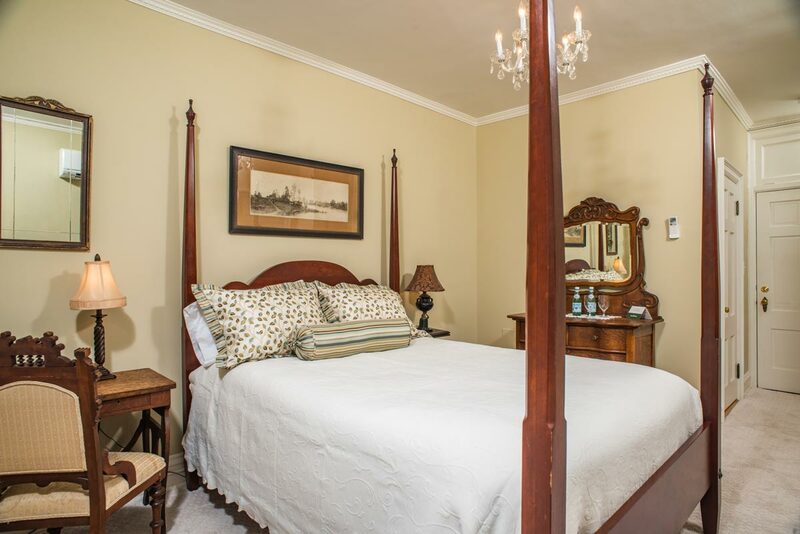 The Luxury Rooms are the largest guest rooms and are located in the original house. 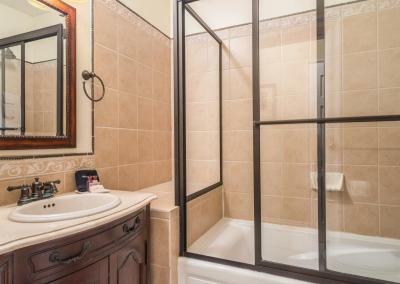 They feature custom designed furnishings, working fireplaces and hand-laid tile bathrooms. 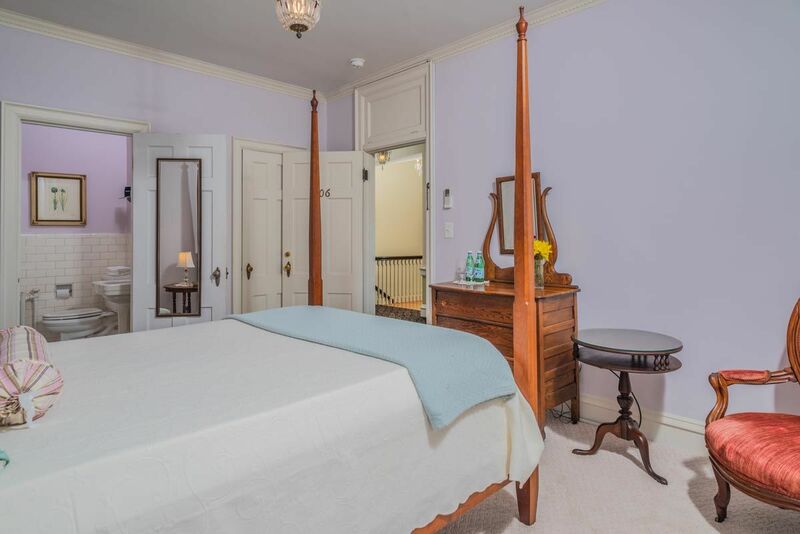 Classic architectural elements include heart pine floors, high ceilings and period millwork. 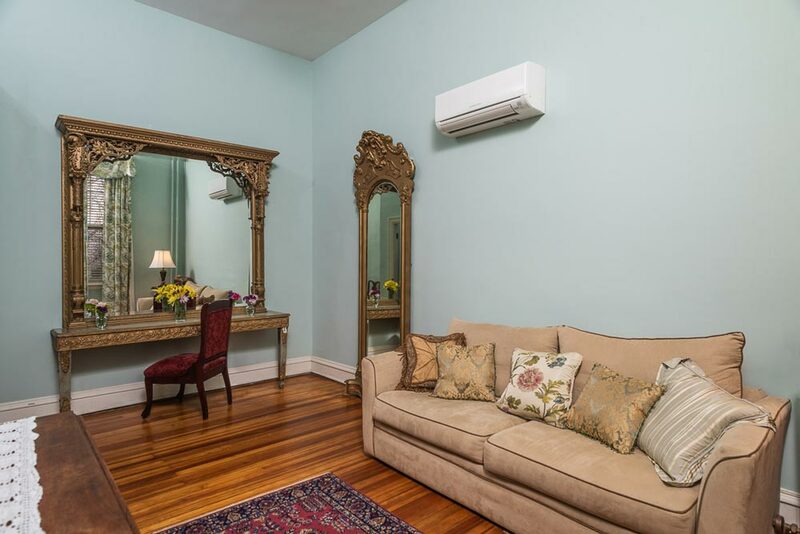 Often called “the Bridal Suite”, this space is perfect for families and brides alike, and can comfortably sleep four adults. 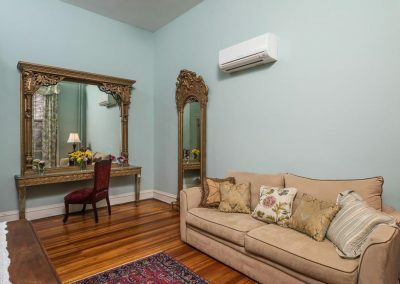 The suite offers a living room with an antique vanity, floor length gold mirror, and a comfortable seating area with a queen-sized sleeper sofa. 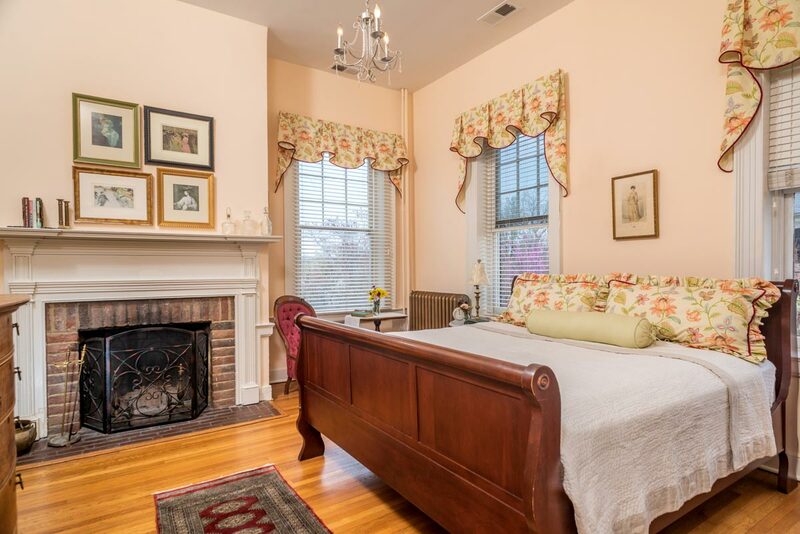 With its peach hues and bright accents, this elegant room is a delight for the visual senses. 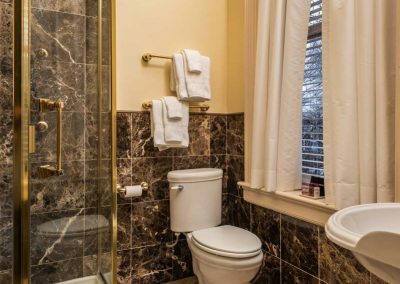 The room features a handsome king-sized sleigh bed and the most spacious and vibrant bathroom at the inn, complete with a large soaking tub. 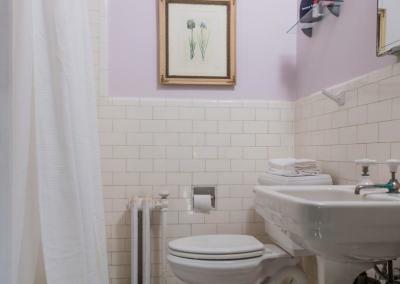 This is an ideal choice for a romantic getaway and weary travelers alike. 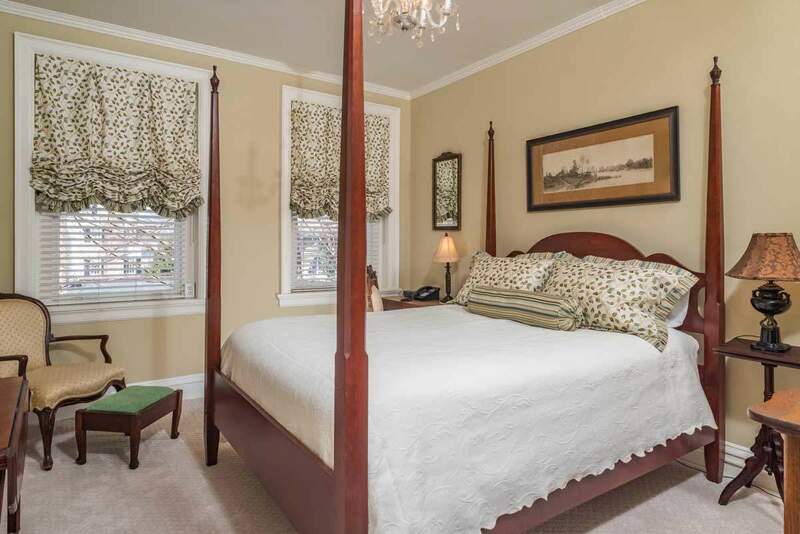 A luxurious room offering a queen sized canopy bed with a gorgeous full length carved wood headboard. 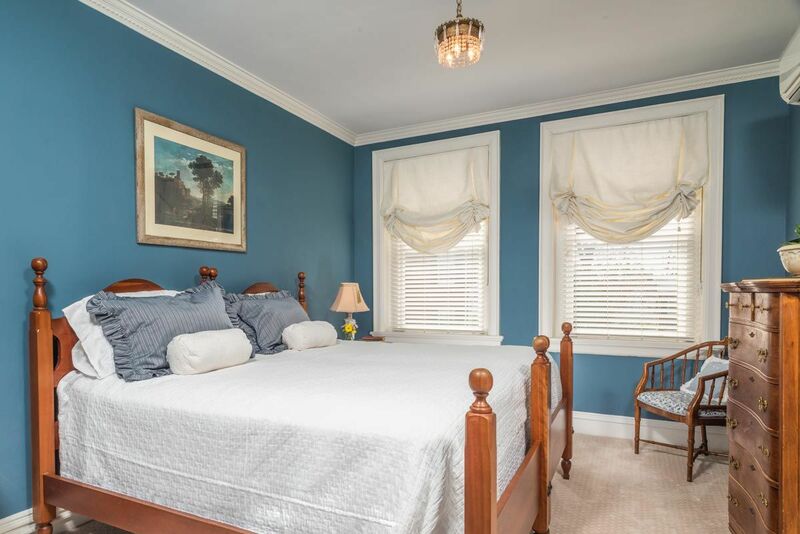 Beautiful sage and eggshell blue décor create a cozy and romantic atmosphere. 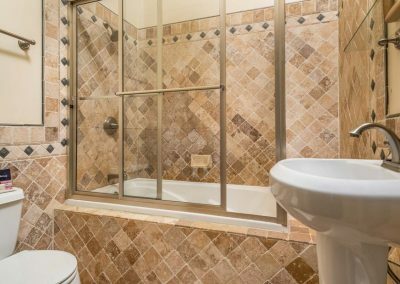 The renovated bathroom features a bubble massage tub and shower combination, completing the room’s accommodations as truly grand. 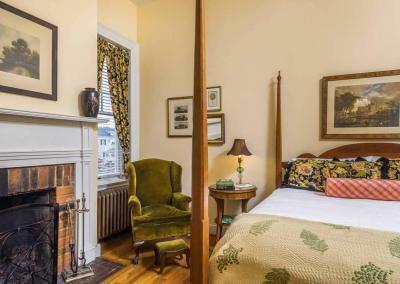 Our spacious Regal Kenmore room features lovely antique details and charming touches, including a working fireplace, 10-foot high ceilings, hard wood floors, king-sized four-poster bed, and a renovated bathroom with a standing marble massage shower. 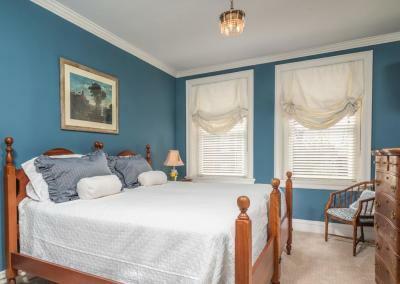 The Deluxe Rooms are are located in the 1932 addition to house. 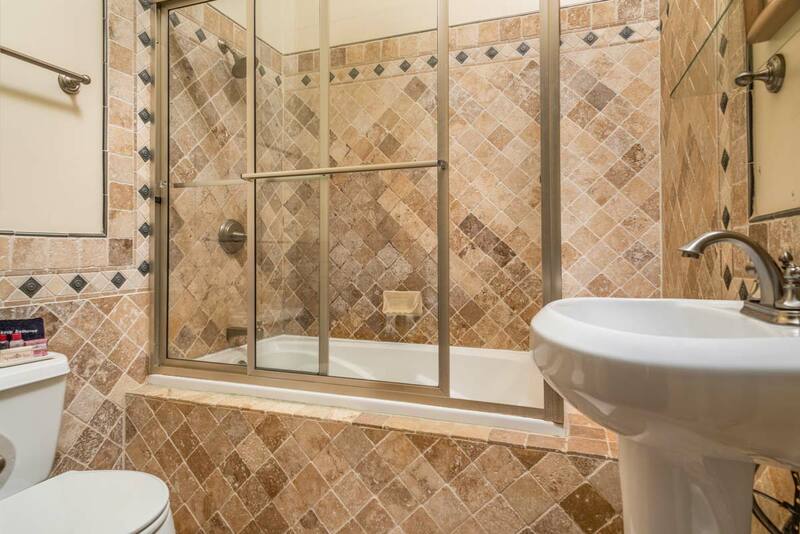 They feature custom designed furnishings, wall to wall carpeting and hand-laid tile bathrooms. 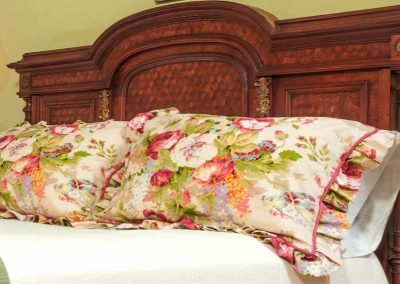 The beautiful rose engraved head and footboard of the comfortable antique queen-sized bed inspired the floral décor for the Rose Parlor. 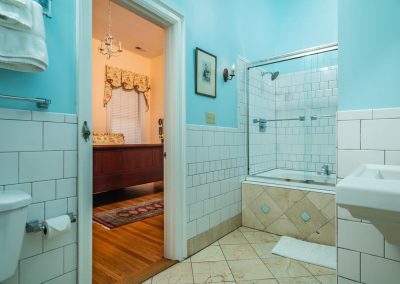 An elegantly renovated bathroom with a shower and bathtub combination completes this cheery cozy room. 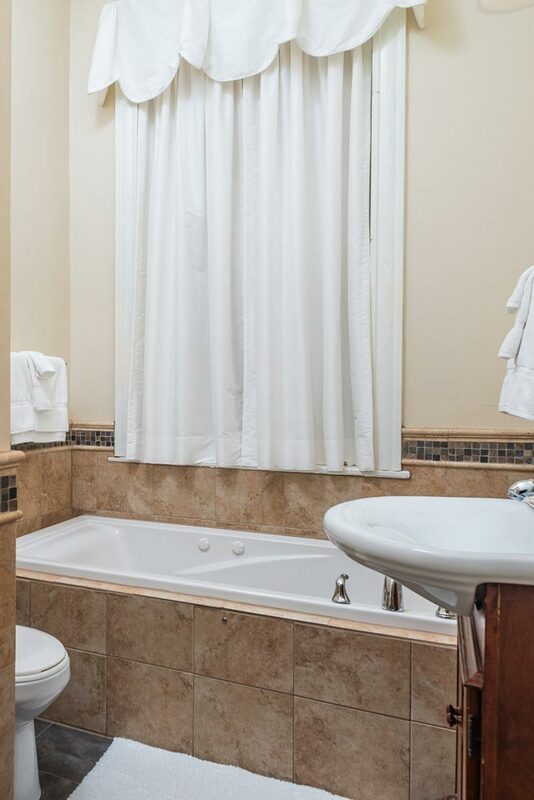 It is perfect for those who wish for a quiet night away. 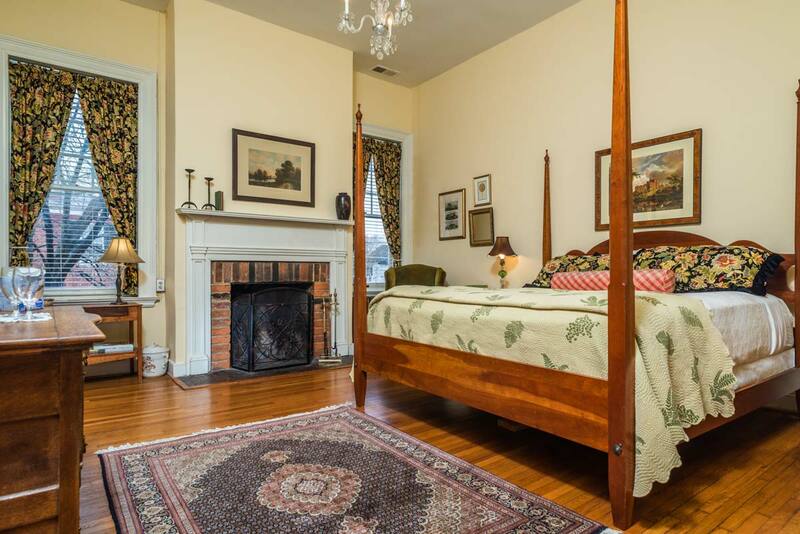 This relaxing room of taupe with blue accents is handsomely furnished with period antiques. 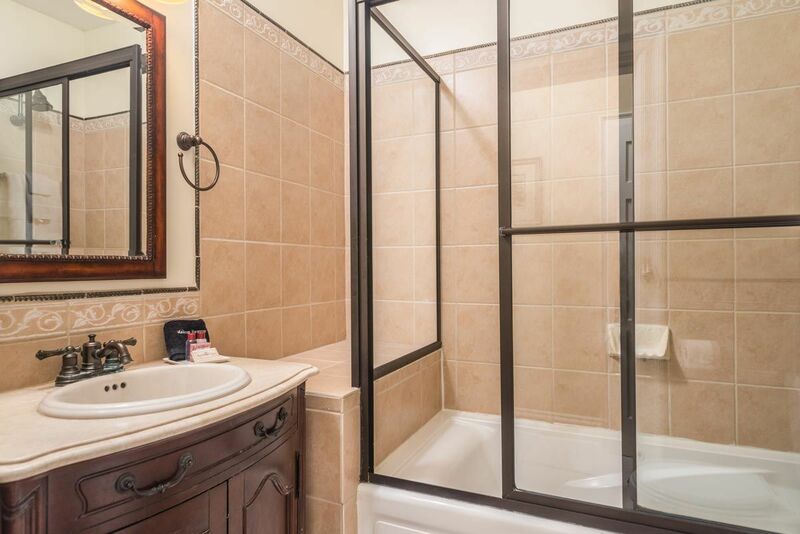 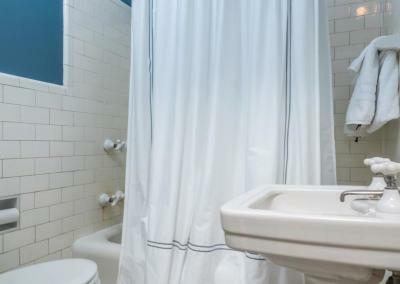 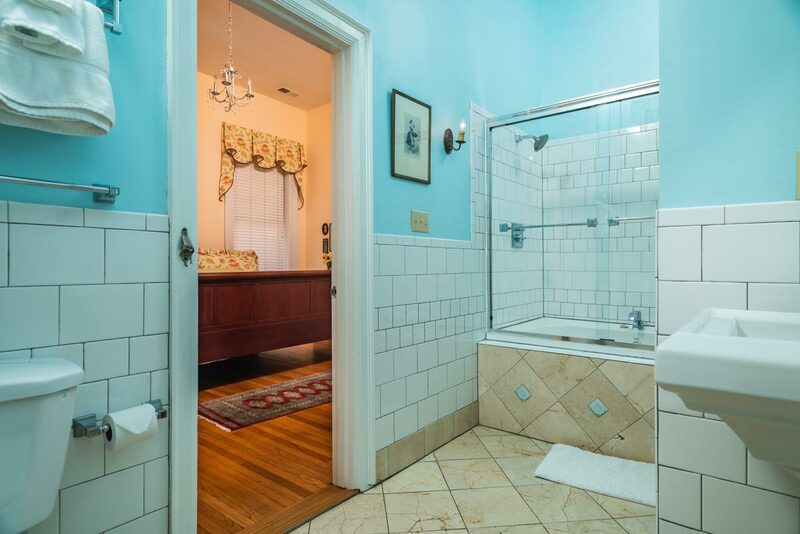 It features a renovated bathroom with an individual size bath tub and shower combination. 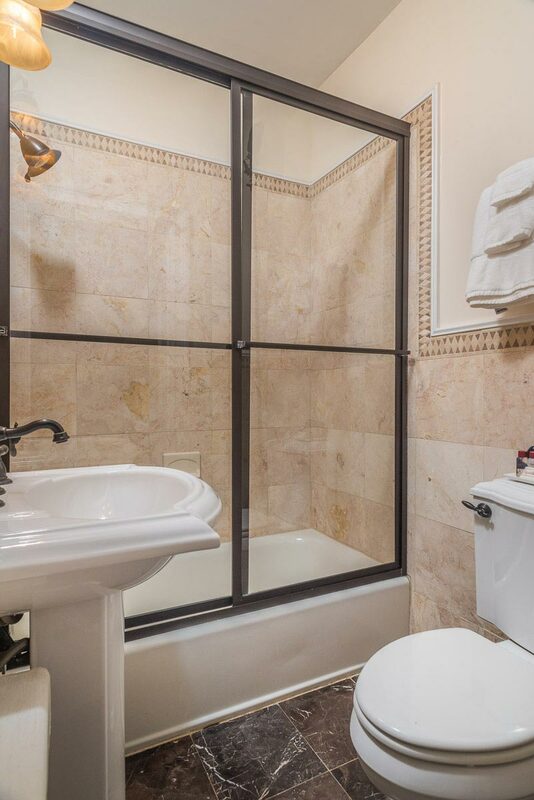 This room contains a connecting door to the Ville de Frejus. 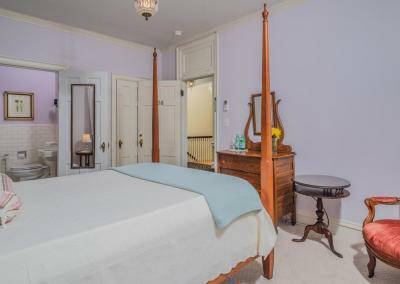 The Standard Rooms are are located in the 1932 addition to house. 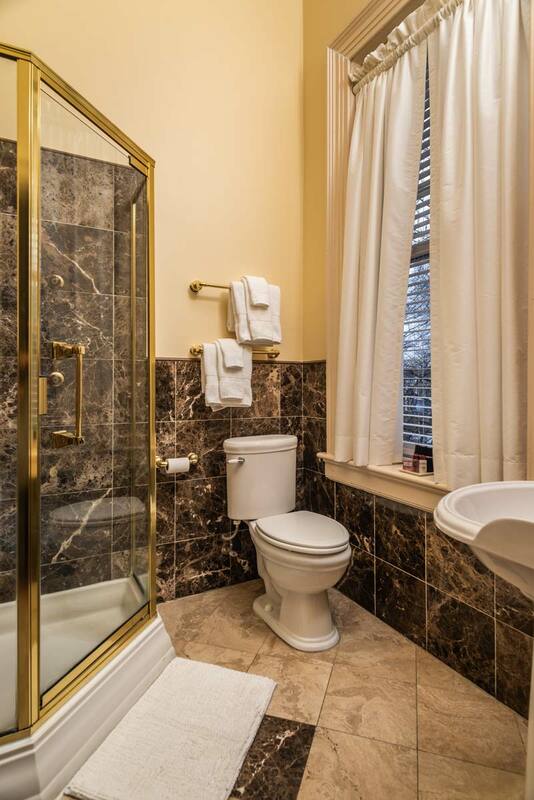 They feature custom designed furnishings, wall to wall carpeting and hand-laid tile in the original bathrooms. 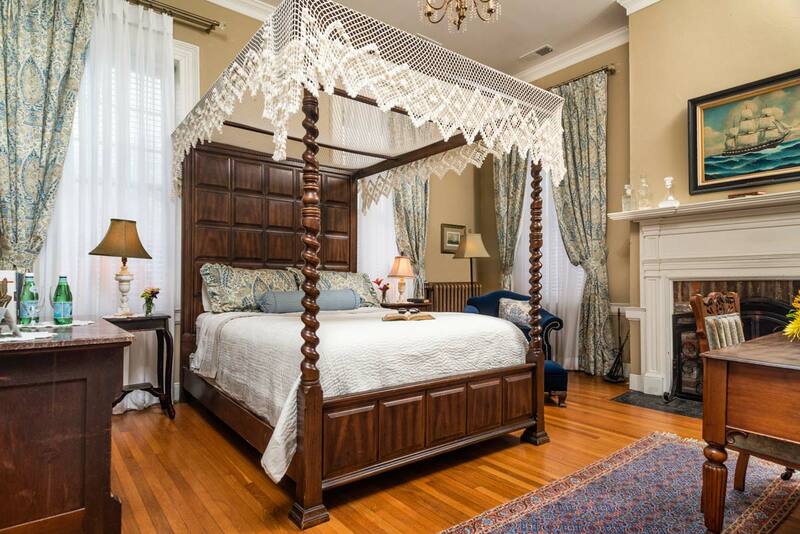 Named after Fredericksburg’s sister city in France, Frejus, this stately room offers the perfect getaway for any guests, in a sophisticated atmosphere. 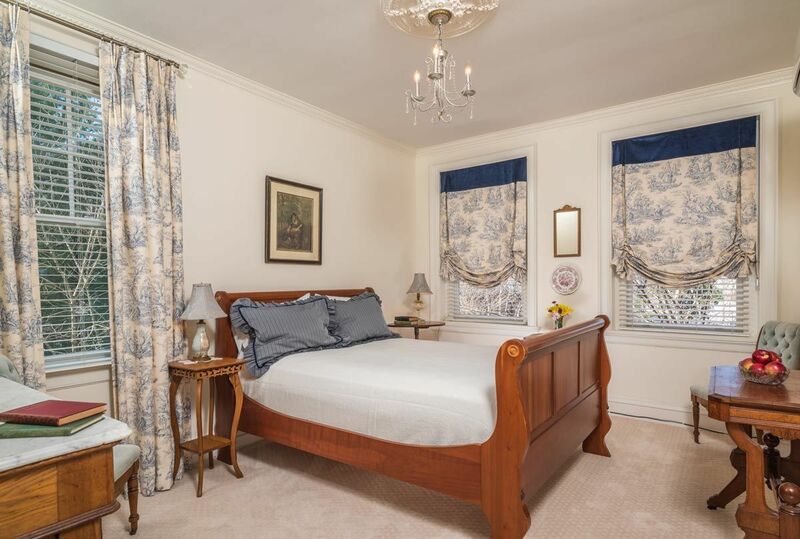 Featuring a queen sleigh bed with a navy and cream French toile motif entertains a sense of old world style. 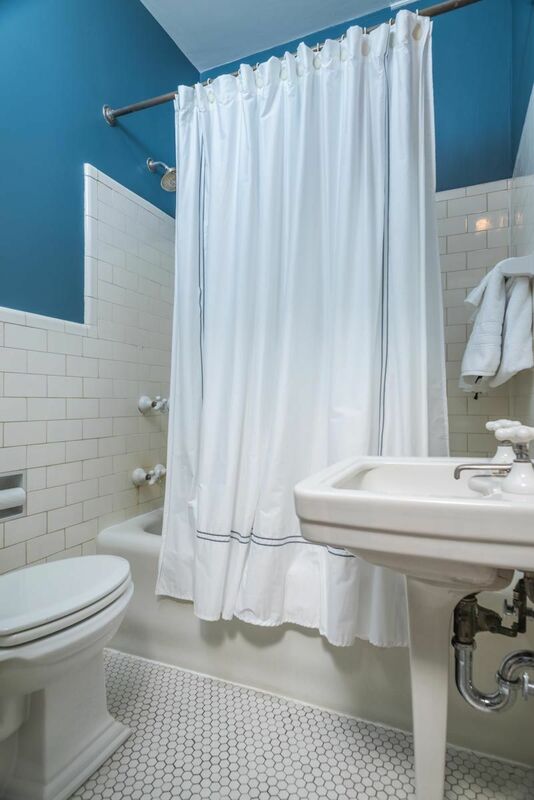 This room also contains a connecting door to the Fielding Lewis for those traveling with more than two guests. 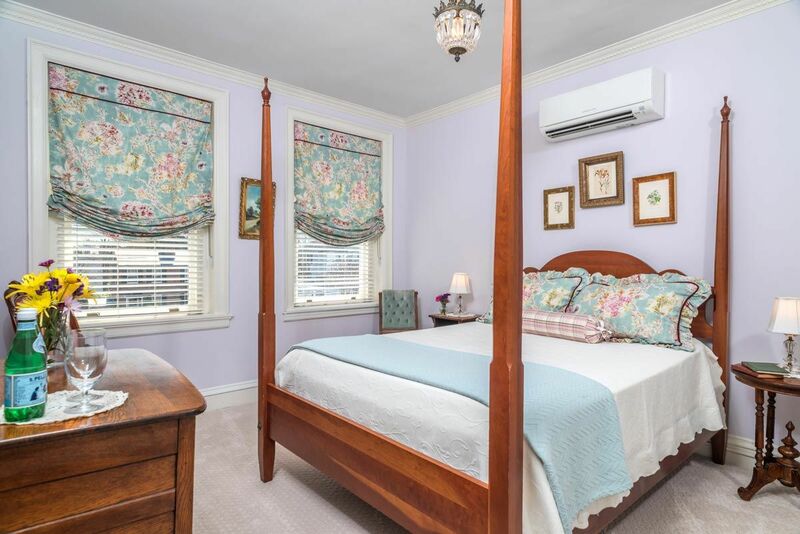 This brightly decorated room is sure to lift the spirit and refresh the soul with its four-poster queen-sized bed overlooking a scenic view of the neighborhood and the garden patio along the side of the Inn. 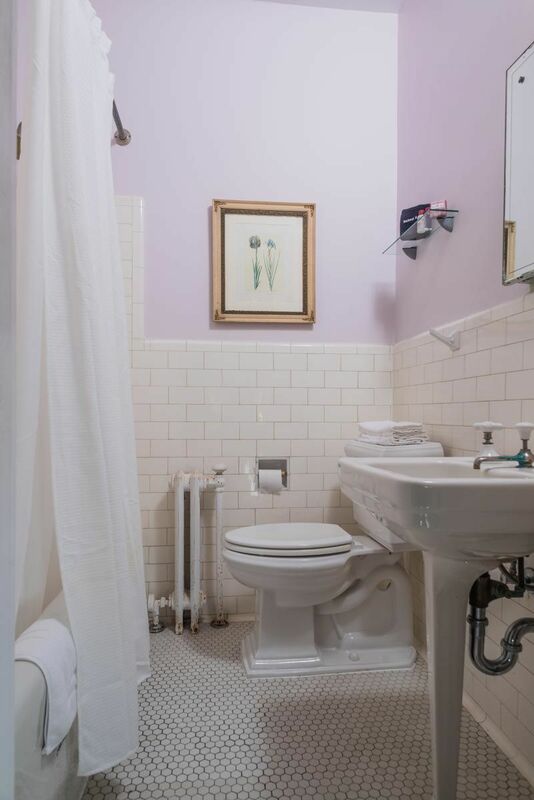 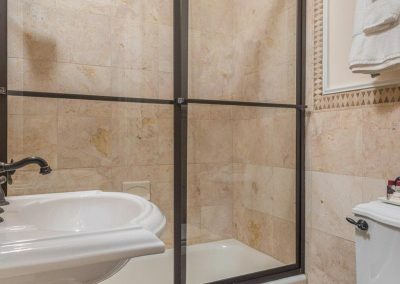 The 1930s bathroom fixtures and tile work in the room’s private bathroom enhance the historic charm. 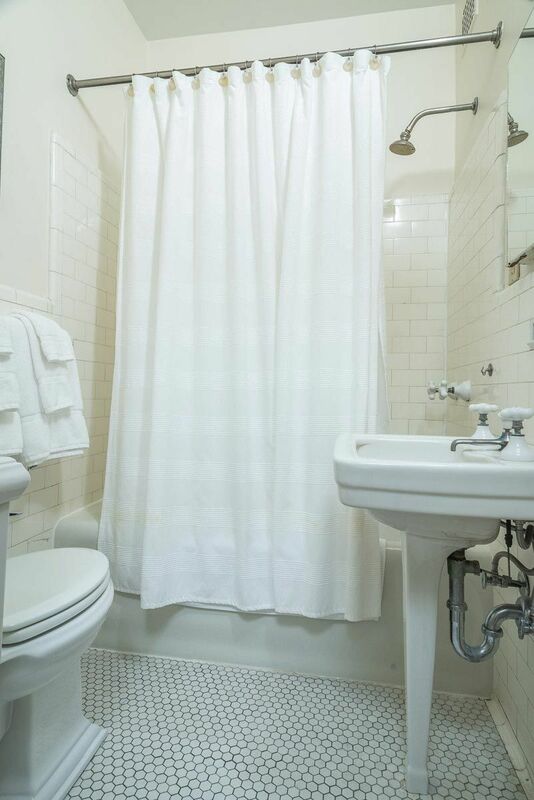 This is a favorite choice for our business travelers due to its quiet location. 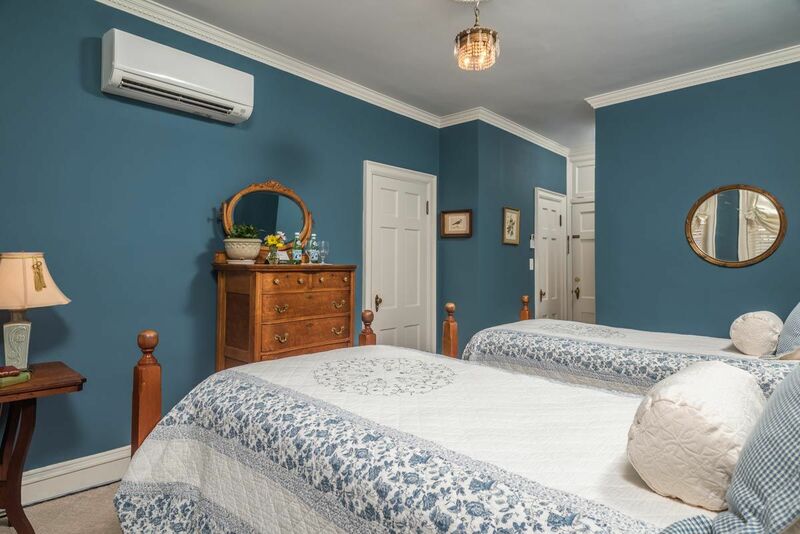 Overlooking the sunken Patio, this playful blue and white room named after Gari Melcher’s Gardens of Belmont, a popular American artist that lived in Fredericksburg until 1932. 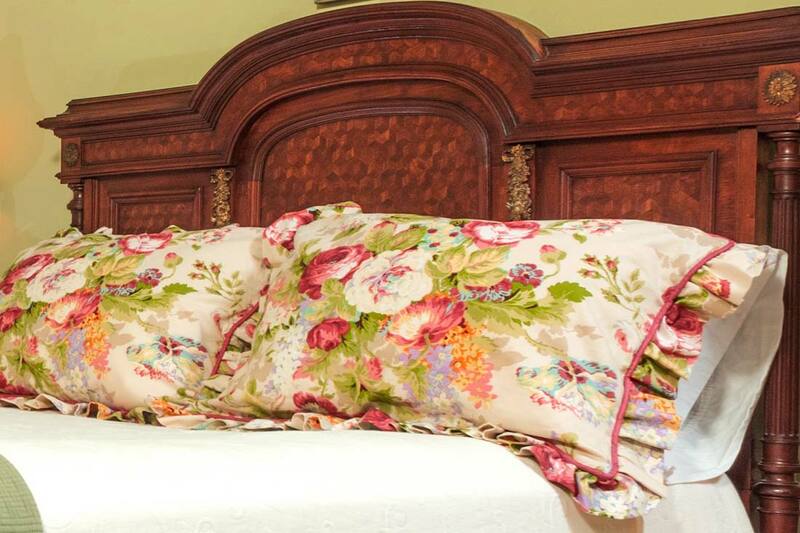 The two twin size beds are perfect for two travelers, or if desired, can be converted into a king size bed. 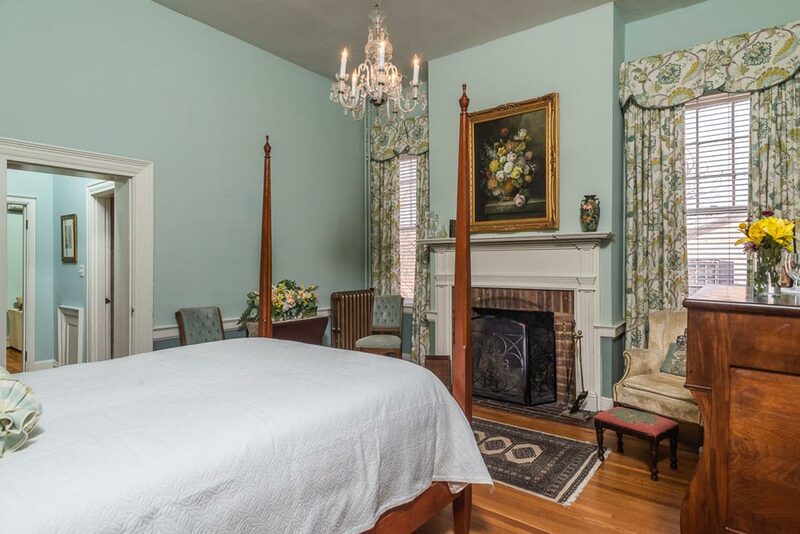 This room also contains a connecting door to the Rose Parlor for those traveling with more than two guests.